Are you sensing a nasty odour coming from your carpet, your sofa, or other furniture in your home? You can try using some air fresheners, but the truth is that the only way to permanently remove a nasty smell from such textiles is to deep clean them. We offer professional and highly efficient carpet cleaning Barking E6 and also the entire East London area. Call 020 3746 6887 right away to receive an offer for deep tissue cleaning, stain and bad smell removal. The services we offer include mattress cleaning, upholstery and sofa cleaning, curtain cleaning, rug & carpet cleaning, end of tenancy cleaning, one off cleaning and after builders cleaning. The prices are affordable and the results are amazing. Your carpet or other furniture will look like new, and will be free of any harmful germs and allergens. Being in the professional cleaning business in Barking for more than 10 years, SATSU Ltd. has the expertise to handle any sort of cleaning emergency or specific type of problem. Available for cleaning every day of the week as well as on bank holidays and after working hours, the cleaning technicians are trained and very efficient at their job. All cleaning machines are of the latest generation and the solutions used for stain treatment and cleaning are 100% safe for people, pets and the environment. We always put the needs of the customer first and uses environmentally sustainable and friendly products to provide a variety of cleaning services, depending on the specific textile, stain, patch or situation. 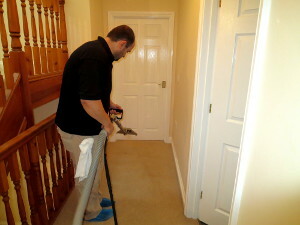 The technicians are trained to assess the material and provide the best solution for the specific stain or other issue. The company offers steam cleaning, dry cleaning for carpets, and mattress cleaning, curtain cleaning, sofa and upholstery cleaning services. This is the best cleaning solution for the finer carpets, rugs and textiles, as it doesn’t involve water, so there is no risk of shrinkage or colour running. This method utilises spraying and embedding special dry cleaning powder or spray on the carpet, and then removing it with a powerful vacuum cleaner, along with any dust and residue. It’s the most efficient deep carpet cleanup method for removing all of the dirt, even from the padding. With the help of a high pressure nozzle, the steam from the mixed water and cleaning solution is inserted in the entire carpet and at the same time most of it is extracted along with the dirt and other residue. Only 3 hours are required for the carpet to dry fully, but we offer a quick drying service upon request. Mattresses can be infested with a horrifying amount of bacteria, dust mites and residue which can actually cause skin or breathing irritations and other more serious health problems. This unpleasant matter can easily be dealt with by the mattress cleaning service offered by SATSU Ltd.. The quality of the service is guaranteed. We offer sofa cleaning as well as upholstery and curtain cleaning. This is especially useful and necessary if there are people with allergies, asthma or smokers in your household. The cleaning process will remove all stains and patches, and will also remove any unpleasant odours. Additional deodorising is also available upon request. Book carpet cleaning Barking today – it is quick and easy. You just call the hot line at 020 3746 6887, or simply fill in the online form, in order to receive a free and non-binding offer, along with all the discounts and promotions you can take advantage of. So, don’t lose any more time and book your cleaning services now!